Hi! I use Ardour in Fedora 12 for recording and mixing local bands and solo artists. 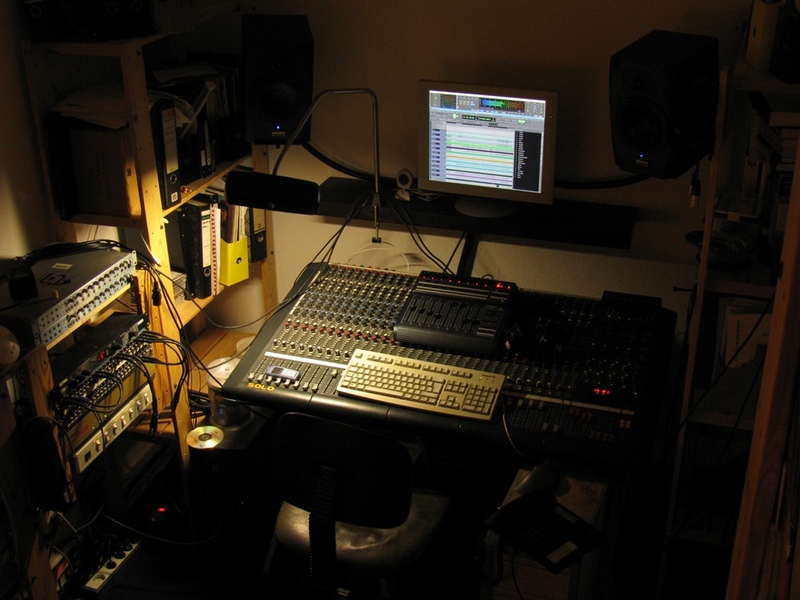 I have been making recordings for about five years and moved to Ardour about two years ago. My workflow vastly improved since then, as I keep discovering new little features. People sometimes ask me why I use Linux in spite of all the additional work that is needed for setting it up correctly. And I can only answer that I will never again use any other DAW than Ardour because it is just perfect for my way of working. I run it on a 4x2,6 GHz machine with 8GB of RAM. My setup is centered around a Focusrite Saffire PRO 26 i/o of which I only use the 8 analog inputs and outputs, as I lack an additional A/D-converter. Connected to the Saffire is a SM Pro Audio TB202 TubePreamp which I mainly use for recording vocals. 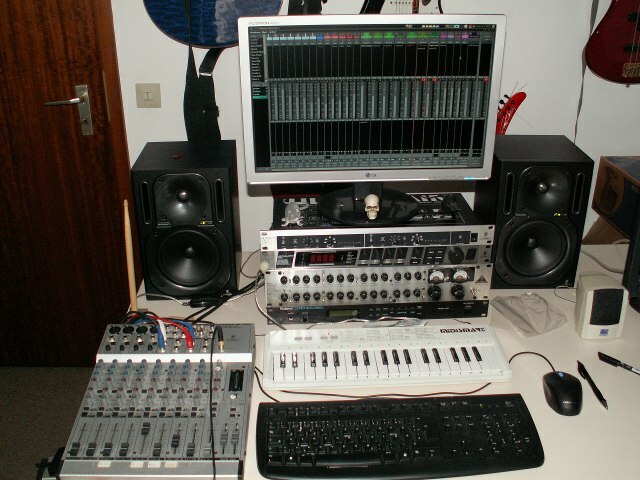 The small Behringer mixer in the picture is only used for some quick patching or for providing a third headphone-mix. As you can see I use two screens (the smaller one I have borrowed from a friend half a year ago and not returned it since ;-) ), one for editing and one for mixing. This works beautifully with Ardour's editor and mixer windows which I can quickly move from one screen to the other, depending on what I am focusing on. 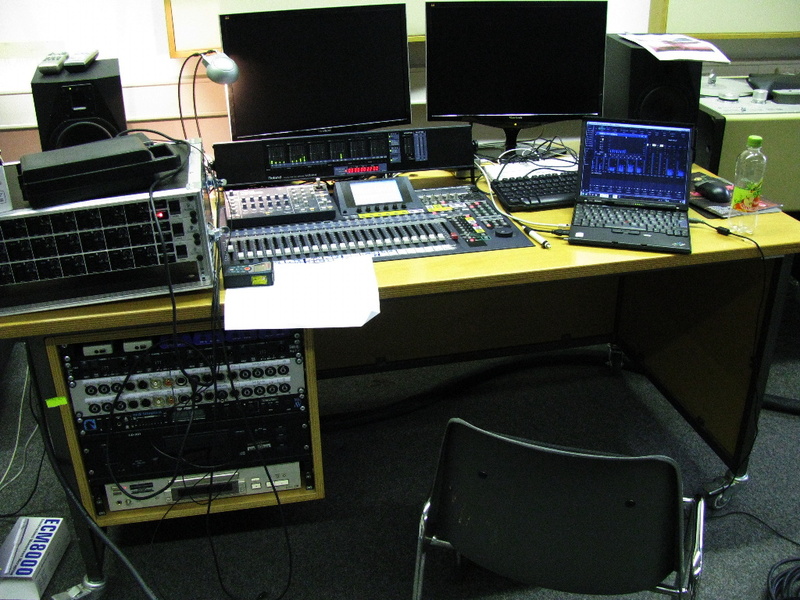 My humble setup using a AMD dual-core 64 Studio system (can record 4 analog signals simultaneously, can listen to 2 soundcards simultaneously). Full-size images can be found at http://stackingdwarves.net/public_stuff/ardour_photos. 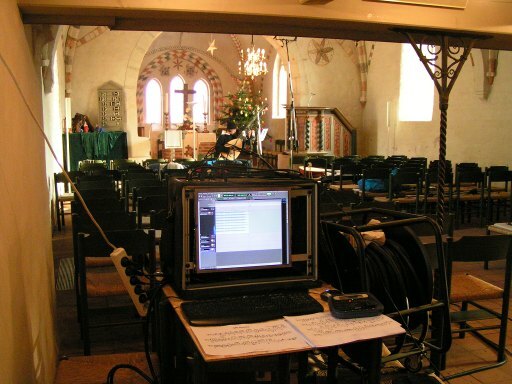 Live recording of an Early Music ensemble off a Mackie Onyx with Firewire option (using the FFADO driver), into Ardour to an external 1TB USB harddisk. Pentium M Thinkpad with Firewire Cardbus adaptor. The amps you can see at the bottom of the rack were driving a 4.0 surround PA system in the courtyard of an old knight’s manor in Düsseldorf. 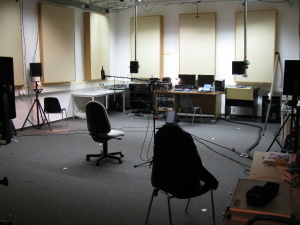 A concert for electro-acoustic musik at the musikFabrik in Cologne, in the former VIVA TV studio at MediaPark. Ardour is running with a 3rd-order Ambisonics master bus that feeds a 12 speaker horizontal system with 2 additional subwoofers. Signal goes through an RME HDSP into a Yamaha LS9-32 board via ADAT. 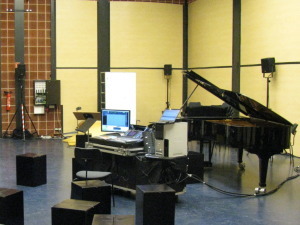 Composers can take control of required parameters during the concert via a MIDI fader box connected to Ardour. For that extra dash of style, a recently refurbished Steinway D concert grand in the background. Here’s my home studio. It used to be an analog 8-Track thing, that’s why there’s a SoundTracs 8-Bus console holding up the keyboard and the Behringer box. It’s still used for signal routing, but I hardly ever mix on it any more, since the half-inch eight track went into cold storage. Ardour has made those analog beauties mostly obsolete. The main interface I use is a RME Digi 9652 I got on ebay. 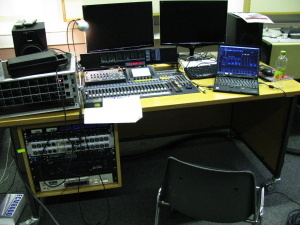 There’s one currently defunct Focusrite Saffire Pro 26 and another one in working condition, for location recording, plus a Behringer ADA 8k for simple line conversion tasks. The adjacent room has a speaker hexagon for Ambisonic surround mixing, which is hooked up via ADAT. An analog 8way multicore runs into the living room. One pretty neat feature is that all stereo systems in the house (coax spheres from the 70s, really small kitchen speakers, and a pair of Magnat shelf cabinets) are wired to my studio patchbay, so that I can perform crap speaker/crap room cross-checks easily while I’m getting myself a coffee. 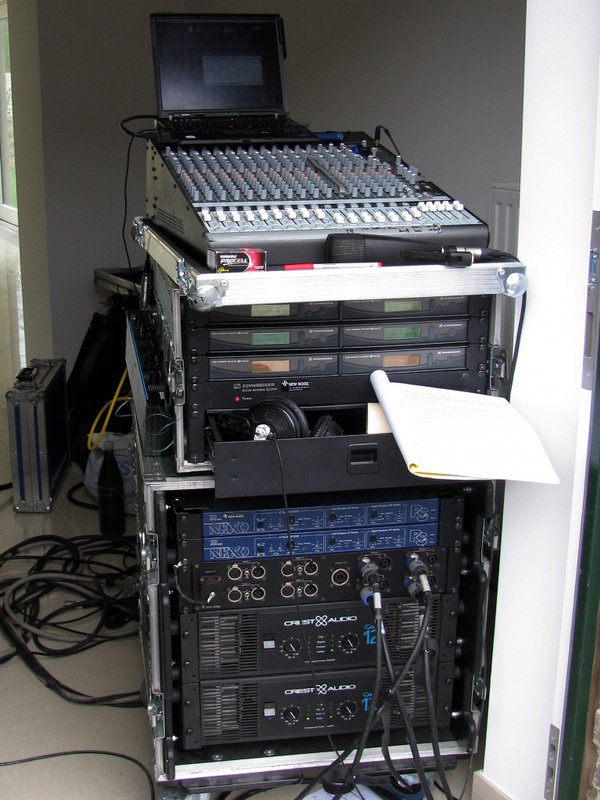 This is my home recording setup, it is based upon a LEM 24-8 mixer, i have the 8 group outs connected to an Echo Layla PCI card, ArchLinux as distribution, and e17 as dm. All the outboard is also connected to mixer. This is one half of my studio where I do all of my sequencing and recording (the other half is a Windows machine used solely for hosting samples, communicating via MIDI over ethernet and SPDIF). This is a Dell XPS 420 with 2G of RAM, Gentoo Linux, a couple of big SATA drives plus an external firewire drive, an RME HDSP Multiface II, two M-Audio BX-5 monitors and an M-Audio subwoofer. 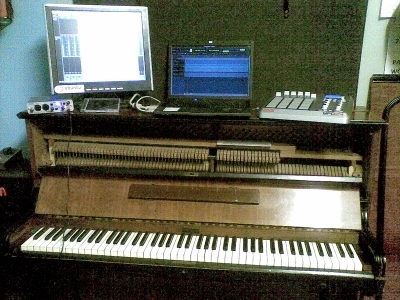 That’s a Tranzport there also and an M-Audio keystation. Note also the K-3D mousepad. Sorry about the terrible quality picture! It’s nothing big but it’s mine Edirol UA-25 and Akai MPD-24. I’m using Ardour for the composition of my A Level Music piece. The computer is just running a stripped down GNOME desktop of Ubuntu. At the moment I use Ardour just for composing, no Mastering or Post-Production Yet, so maybe not an impressive studio setup, but it's a lot more than what I need to create ideas and lay them down to tracks. 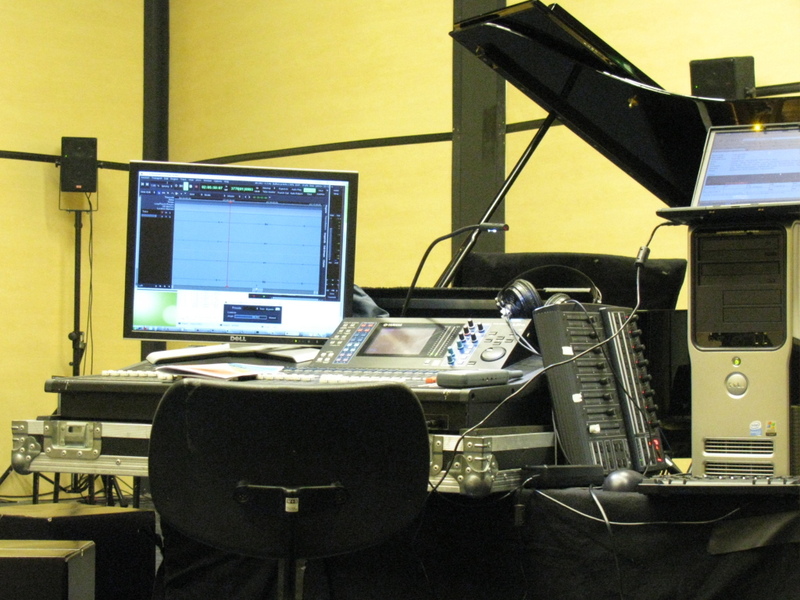 Mostly I use Ardour for recording and arranging music for friends and occasionally myself. I, along with a group of friends, rent an old school building (north of Pittsburgh, PA, USA) which we’ve got permission to basically do anything we want with… It is and will always be a work in progress (note the insulation poking out of the unfinished wall on the right). Hand-wired TT/Bantam patchbay -- many months of soldering! I switched from Cubase (windows) to Ardour (linux) in 2007. I never regret that choice. This year me and my band want to record our new album with Ardour. I love the old school building. I spent several days on my motorcycle riding PA. I went through the Allegheny Forest and every winding and twisty road I could find. Had I known you guys were there I’d have dropped in. Cool setups everyone. It’ll make me self-conscious about posting my minuscule setup! I have an E-MU 0404 USB, which isn’t support. Which makes me glad to be on Mac. It’s also nice to open up Garageband and do an easy MIDI track/project. This is the Radio UFSCar recording Studio.We are a Universitary Radio station from São Paulo countryside, city of São Carlos, Brazil. 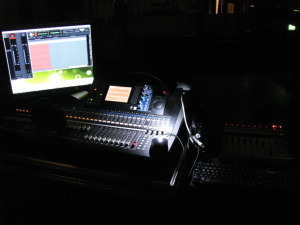 We brodcast using the Radio automation free software “Rivendell” and use Ardour for all recording: Voiceovers, Jingles, and Live Music (We brodacast them Live and do multitrack recording as well). The PC is a VIA Eden 1.2 GHz with a single 5400rpm hard drive, extremely slow, but reliable, and sufficient to record 20+ tracks at 44.1 kHz/24 Bits on UbuntuStudio 8.04 and with ardour 2.7.1 (containing some manual fixes which were merged into 2.8.x). It is a mini-ITX board in a small case, housing a RME HDSP9652. As Mic Preamps and AD/DA converters I still use Behringer ADA8000, but I will replace those soon. Next to the keyboard is a Frontier Tranzport remote control, working pretty well with its kernel driver. Everything except the computer can be packed in the mix bag you see on the table, allowing a quick setup. This is Kubistudio, established in Milan, Italy and based on free software. Fostex G16 16 track 1/2" reel deck. 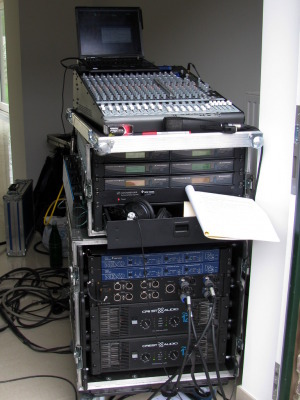 The EZBus digital mixer is connected to the PC over ADAT via an EZ8 ICE1712 based PCI card that I provided alsa support for when I first got this gear, back in about 2004. These days though, I only use the EZBus mixer for media device mixing (VCR, PC onboard sound playback, turntable, cassette player, portable mp3 players, etc). My primary ardour input chain goes something like: Tube pre -> Mackie line in -> Mackie Insert out (first click) -> AF12 interface. If I'm recording analog it almost always gets recorded from the tape deck to Ardour ultimately. Since I moved in here my friends have grabbed the neighboring units on either side of me, as well as upstairs from me and every unit is either a studio or a jam/practice space, so there is more musical gear than I can list here at our disposal. I don’t have any pics of the equipment, but i can assure you Studio Magnetophon has been using FLOSS exclusively for about 6 years now. Thanks to Paul and the rest for making it possible! The studio runs 64studio with jconv, tetraproc and OM, on a monster server in a separate room, with 32 i/o via a digital snake and remote X. A poor man’s XDubber! You can find the rest of the technical details on www.magnetophon.nl. 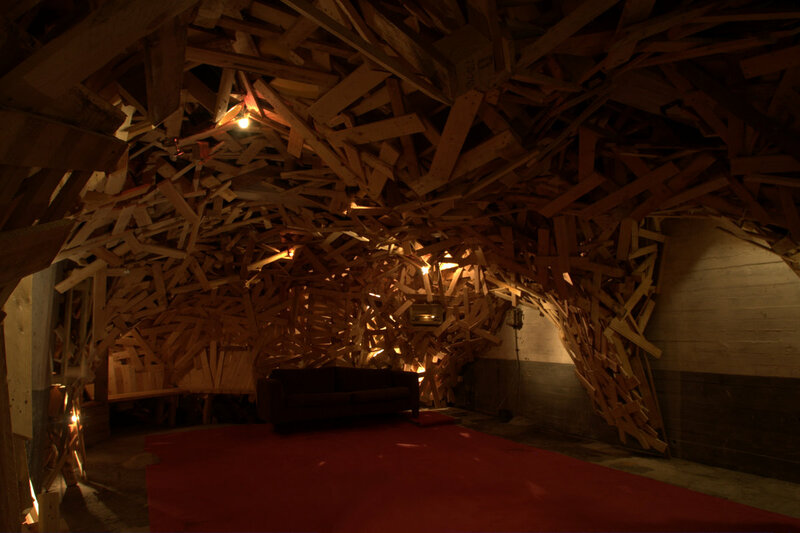 It is located in Cultural Freezone Landbouwbelang, a very culturally active squat in Maastricht, the Netherlands.